Hello friends and Happy New Years Eve! This year has come and gone so fast but I've loved every minute of it. I feel so blessed to have met you all in this blogging world! I was hesitant to actually open an account and put it off for awhile but I'm so glad I did. Today I won't be sharing a recap of 2013 or my top moments on instagram. Today I'm excited to announce that one of my favorite bloggers, Lisa from Showered with Design, and I have created the "Inspire Me 2014" Blog Challenge. I know what you're thinking, a challenge first thing in the new year? Another task to put on your never ending list! It's not that bad, we promise! What is the challenge? It's basically a blog everyday type of thing, just like 'Blog Every Day in May' was. I don't know about you, but within the past few months it's been hard to come up with meaningful posts. We as bloggers (and humans in general) tend to lean towards pleasing others sometimes. Sometimes we may see a link up going around or a certain popular topic being discussed and we try our hardest to also write something about it. Sure, we may be able to actually write a decent post about the topic but there's so much pressure because you want to make sure your post is funny, worth reading and going along with whats "in" at the moment. I know I've felt that which then leads me to not write at all or not care as much. It's also hard when time is an issue. You want to crank out this great piece of writing but you don't have enough time to make it what you think it should be. So you either write something that is just some rambles or you dont write at all. Either can be fine sometimes but then you feel guilty either way for not producing what a blogger should. There are no rules to this blogging thing, which I tell newbies all the time. This blog is for you. For you to sit and write, for you to experess your thoughts and get creative! That's why we've created this challenge. Let's get back into what we once knew blogging to be. We've come up with fun, fresh and creative topics for you to write about everyday! Really, there aren't any! Take these topics and run with them. We want you to enjoy blogging for awhile without the pressures of "what should I write about?" and maybe even make some new friends! Please take the button below if you'd like! Place it on your sidebar or in your post, whatever you'd like. Otherwise, please link our names up in your post. We've been so kind and have left the weekends to you. Topics have been set for weekdays only. Weekends are for relaxing and being with loved ones! Speaking of weekends, don't feel you have to make every single post this month one of the topics. Please write about things you normally would, if you wish! If you want to skip a day, no big deal! Feel free to make it up on a weekend or not at all. Everyday we'll have a linkup section so you can link up your posts and go visit others. The topics we have come up with are fun, serious and creative. Take them however you want. There isn't a right or wrong way to do them! Just start writing and see where your imagination takes you! Thursday, January 2: Lets make the first day easy! What did you do for New Years? Tuesday, January 7: When is your birthday?! We’d all like to send some wishes. Wednesday, January 8: It’s no secret we all ‘Paid it Forward” in 2013, what are some Random Acts of Kindness you’d like to accomplish this year? Heck! Make it into another challenge for yourself. Friday January, 10: “The Side of Me Nobody Knows” – write down 2 or 3 secrets that no one knows about. Mix it up and write two secrets and a lie and make your followers guess the lie! Thursday, January 16: I’m a New England girl and used to taking pictures of the beautiful snow but some of you don’t get to experience that. Take a photo of what your “winter wonderland” looks like. 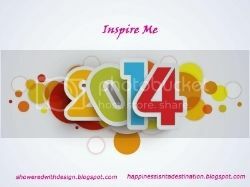 Friday, January 17: What inspires your blog posts? Get a little deep and pick a past post that is meaningful to you. Tuesday, January 21: Do you have any awesome vacations planned for the year? If not, where would be your ideal spot? Thursday, January 23: Many new babies have been introduced into the blogging world in the last year. Tell us about one of the funniest moments you’ve had with them. Friday, January 24: Share some new trends/makeup/online shops you’ve found recently and include a few photos! Monday, January 27: The littlest thing can set us off. Right about a pet peeve and try to get creative! Thursday, January 30: Tell us something you always remind your husband/fiancé/boyfriend about. For example “happy wife happy life.” Let’s face it, it’s fun to tease them! Friday January 31: Last day of the month! Reflect on how 2014 has been so far. Come join us in 2 days, Thursday January 2nd, to inspire a wonderful 2014! Looks like fun! I agree that the year went by so fast! I can't believe it! I’m doing a giveaway today and would love for you to check it out! Happy New Year!